DC Dana: Oh, The People You Will Meet... (AKA the post written entirely around the fact that I've chatted with Heather Armstrong) "
I was recently in an elevator with an older gentleman who started talking to me and I realized his voice reminded me of Tom Brokaw (Who I think is hot. Still.). And it made me remember the time when I first met Mr. Brokaw: After he'd just crawled through a window into the room I was standing in. No, Tom Brokaw did not break into my apartment (although that would've been awesome.) He had been out on a balcony of the Old Executive Office Building (the giant gray gothic building next door to the actual White House that actually holds 98% of the White House staff. And also my former office building.) The only way to get out on that particular balcony is to basically go through a window from an office where my coworker (who later married a White House Press Secretary -- seriously, people meet their spouses ALL AROUND ME yet somehow I'm still dating guys like this...) had her desk. So after Tom Brokaw is awkwardly stepping back into the building, I make my way over and shake his hand, and that becomes one of my favorite strange encounters with public figures. I’ve had others though. 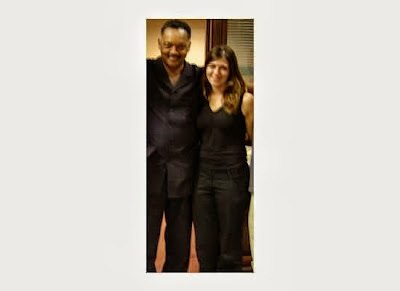 -I met Bill Clinton in the back hallway of a local hotel...Ok that sounded way more scandalous than it actually was…. -I slightly tripped and nearly curled my ankle while walking out of the West Wing, while General Myers, the then Joint Chief of Staff for the Pentagon, was walking in. He ignored me politely. -Kerri Strug started working in the White House Correspondence office while I was still working there so I had my friend casually bring me by so I could squeal and say how much I admired her meet her. 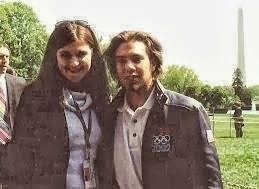 Apolo Anton Ohno. I kind of want to have his babies. 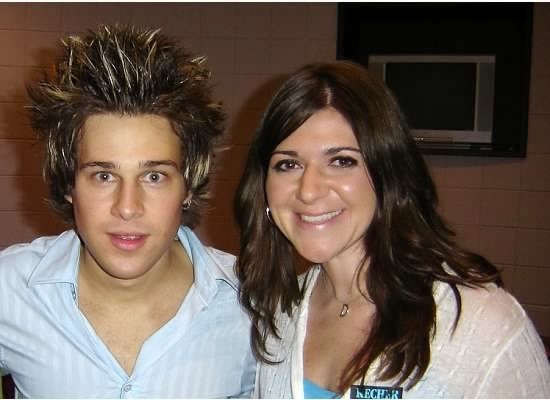 -Ryan Cabrera sang at the Republican National Convention once and my friend was chosen as his “handler.” She kept in touch with his team after that so whenever he came back to do concerts, we’d get escorted backstage, parading smugly in front of jealous twelve year-olds. Look how happy and not like a trapped animal he looks here! -And finally, HeatherArmstrong, AKA Dooce. I started following Dooce years and years ago, before most of my friends had heard of her blog. Then, she blew up and started doing things like going on national T.V. and being invited to blogger roundtables at the White House (she lives in Utah). I remember reading that she was going to be at the White House at some point one week, but it barely made a dent in my brain, since I was about to leave for a vacation in Turkey and Greece with the other GoldfishPoodle and several other friends. 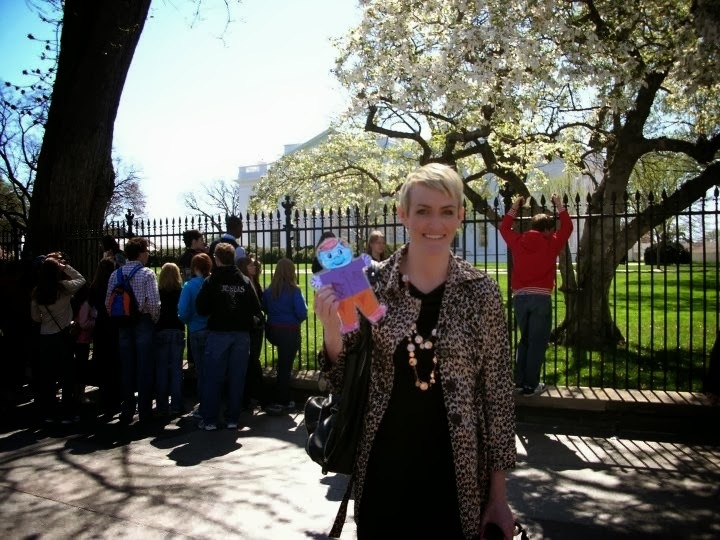 Anyway, before I leave for vacation, I was taking a Flat Stanley around DC for an elementary school kid that my friend, who is a teacher, sent me. I decided Stanley needed to see the White House, so I marched him down on my lunch break. And I glance down Pennsylvania avenue and see this tall, skinny women, with purple tights and cropped blond hair, and I instantly know: It’s Heather Armstrong. It’s Dooce herself. Right! There! I immediately approach her as if we’re friends. 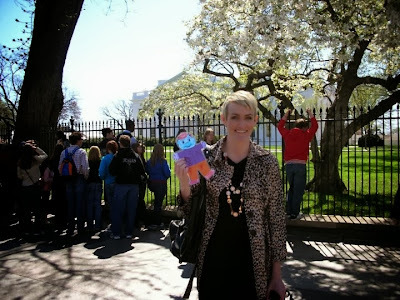 And she mentions that she’s nervous about going to the White House and something comes over me and I ask “would it help if you took a photo with Flat Stanley?” And we both giggle uncontrollably. And that's still one of my favorite random run-ins in This Town.